Doppler Radar and Weather Observations deals with the use of Doppler radar to make observations of a variety of weather phenomena such as tornado vortices, hurricanes, and lightning channels. Topics covered include electromagnetic waves and propagation; weather echo signals; Doppler spectra of weather echoes; and meteorological radar signal processing. Rain and turbulence measurements are also considered, along with observations of winds, storms, and related phenomena. Comprised of 11 chapters, this book begins with an introduction to weather radar principles and how the radar parameters and signal characteristics relate to the target's meteorological properties. The effect of the atmosphere on the path of the signal is then examined, together with techniques used in extracting a target's properties from its echoes. The radar signal path from the transmitter, through the antenna, along the beam to the target, and on its return to the receiver is also discussed. Subsequent chapters explore the discrete Fourier transform and its application to weather echo signals; the weather Doppler spectrum and the signal processing methods used to derive its principal moments; range and Doppler velocity ambiguities as they pertain to distributed targets; and the limitations imposed by antenna sidelobes, ground clutter, signal decorrelation, and power. A comprehensive treatment of pulse compression and the Doppler processing of frequency modulated signals is given. 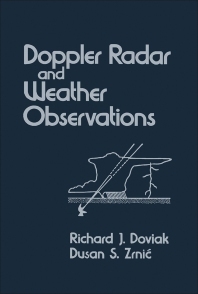 This monograph should be of value to oceanographers, meteorologists, atmospheric scientists, and radar engineers, as well as students and researchers interested in Doppler radar principles.